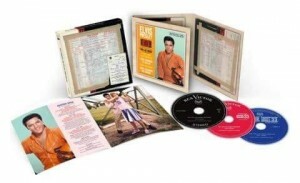 Follow That Dream is pleased to announce the release of Elvis: The Viva Las Vegas Sessions. This is the ultimate Viva Las Vegas 3xCD set that includes more than an hour of previously unreleased false starts, break downs, and complete takes! All tracks have been recently remixed and mastered from the original 3-track session tapes. The 8”x 8” slipcase replicates an original Session Reel box. The 28-page booklet includes rare photographs, memorabilia, session data, movie trivia, Ann-Margret bio by the late Stuart Colman and movie overview by Alan Hanson. The 3xCDs are housed in a CD carrier adorned by original tape box documentation. This release is a strictly LIMITED EDITION. DISC ONE: Soundtrack: Viva Las Vegas / Yellow Rose Of Texas – The Eyes Of Texas / The Lady Loves Me / C’mon Everybody / Today, Tomorrow And Forever / The Climb (planned record version – take 3) / What’d I Say / Santa Lucia / If You Think I Don’t Need You / I Need Somebody To Lean On. Bonus Songs: Night Life / Do The Vega / You’re The Boss. First Takes: Viva Las Vegas (take 1) / Yellow Rose Of Texas – The Eyes Of Texas (take 7) / The Lady Loves Me (takes 1-2) / C’mon Everybody (take 3) / Today, Tomorrow And Forever (takes 1-3, 5 & 4) / What’d I Say (takes 1-2) / Santa Lucia (v.o. take 1) / If You Think I Don’t Need You (takes 1-2) / I Need Somebody To Lean On (takes 1-2) / Night Life (take 2) / Do The Vega (take 1) / You’re The Boss (takes 1-3) / Today, Tomorrow And Forever (2012 takes 1-2, duet). DISC TWO: Outtakes: Night Life (takes 1 & 3) / Night Life (takes 4-8) / C’mon Everybody (takes 1-2 & 4-5/M) / If You Think I Don’t Need You (takes 3-7) / I Need Somebody To Lean On (takes 3-5) / I Need Somebody To Lean On (takes 6-8) / Do The Vega (take 2) / Santa Lucia (track, takes 1-2) / Viva Las Vegas (take 2) / The Climb (takes 1-2 & 4-7) / Yellow Rose Of Texas – The Eyes Of Texas (takes 1-4) / Yellow Rose Of Texas – The Eyes Of Texas (takes 5-6 & 8-9/M) / The Lady Loves Me (takes 3-6) / You’re The Boss (takes 4-8) / You’re The Boss (takes 9-10) / Today, Tomorrow And Forever (2012 take 6, instrumental) / Santa Lucia (vocal overdub, take 2) / Santa Lucia (vocal overdub, take 3) / Today, Tomorrow And Forever (movie version, vocal overdub 2016 take 8) / What’d I Say (takes 3-4/M). DISC THREE: Movie Tracks: C’mon Everybody (movie version, take 7 with overdubs) / Today, Tomorrow And Forever (movie version, v.o. take 10, edited) / The Climb (movie version – take 9, edited) / Santa Lucia (v.o. take 6/M, movie version) / Appreciation (Ann-Margret, take 3 & pickup take 2) / My Rival (Ann-Margret). Outtakes: Night Life (takes 9-10) / Night Life (take 11) / Night Life (takes 12-13) / If You Think I Don’t Need You (takes 8-10) / If You Think I Don’t Need You (takes 11-13/M) / I Need Somebody To Lean On (takes 9-15) / I Need Somebody To Lean On (takes 16-19) / Do The Vega (takes 3-7/M) / Viva Las Vegas (takes 3-7/M) / The Climb (take 8) / The Climb (take 9) / C’mon Everybody (takes 6-7/M, movie version) / The Lady Loves Me (takes 7-9) / You’re The Boss (takes 11-12) / You’re The Boss (takes 13, 15 & 14) / Santa Lucia (vocal overdub, take 5) / Today, Tomorrow And Forever (movie version, 2016 vocal overdub take 10/M). NOTE: This release will be up on our website store to pre-order online within a day or two, alternatively just send me a private FB message or call 01903 525917 to pre-order. This entry was posted on Thursday, July 19th, 2018 at 9:36 am	and is filed under FTD & Sony Updates. You can follow any responses to this entry through the RSS 2.0 feed.